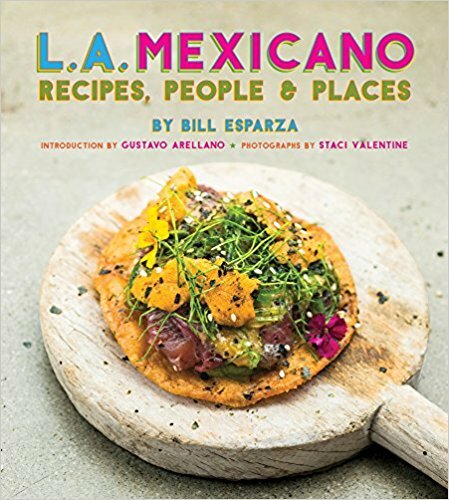 This Sunday, May 1, at the Broad Stage in Santa Monica; KCRW and SMC Associates present Global Street Food with Evan Kleiman, a discussion with Pulitzer Prize winner Jonathan Gold, chef Jet Tila, OC Weekly’s Gustavo Arrellano; also joining will be Lesley Tellez of the Mija Chronicles in Mexico City and Time Out Kuala Lumpur editor Robyn Eckhardt via SKYPE. The event is Sold Out, but we have a pair of tickets with your name on them available here on StreetgourmetLA’s Global Street Food ticket giveaway! Here’s how you play to win!! The best street food experience wins, tell me about something unique, or just simply delicious. The most appetizing bite wins. Wow me with your experience! It doesn’t matter if it’s a cart, stand, food truck(old or new), street table, shack, or just from a basket. 1.Tweet to @streetgourmetla about your greatest street food experience with the phrase "I had global street food @ name, location, what you had" (ie. @streetgourmetla I had global street food at La Guerrerense; Ensenada,MX; sea urchin tostadas)It’s OK if you’ve never left the country because we have Global Street Food right here in LA, too. 2.You must mention @streetgourmetla so I know that you tweeted. If you don’t have a twitter account, e-mail the phrase I had global street food etc. to my e-mail:billiard68@yahoo.com. Please include your full name, and contact information. 3.The contest ends at 12AM PST this Friday, April 29; the winner will be announced on twitter. 4.The winner and their guest will pick up their tickets at the Global Street Food will call. Note: Contestants on twitter, please follow me during the contest so you can DM me your e-mail confidentially; you may unfollow after the winner is announced if you wish. The discussion topics will include how global street food inspires chefs, and the food truck craze sweeping the nation. Attendees will also get to sample hand selected group of local food trucks to taste what’s Good Food on the streets of LA: India Jones, Mariscos Jalisco, Let’s Be Frank, Nom Nom Truck, Piaggio Gourmet on Wheels, and Crepe ‘n Around. Global beats with be provided for your listening pleasure by the Masanga Marimba Ensemble. Street food is the most common dining experience shared by the people on this planet. It’s the only dining experience available to all classes. Street food has preserved our culinary traditions, culture, and creates community. 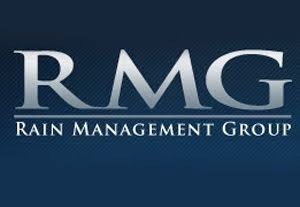 The scent of grilling meat in the night air, the cluster of people around a stand, the street beacon stream of cheap lights, the lyrical cries of a vendor; this is what gets us out into our parks, plazas, city centers, and neighborhoods. So pull up a plastic chair, sit on a bench, grab a milk crate, find a wall to lean against, or just stand. It’s Global Street Food with Evan Kleiman. Veronica! That's her name.....I think. Veronica is a third generation artisan of the corunda, also called the tamal de ceniza(ash tamal). The corunda is a pre-hispanic, triangular-shapped tamal from the Purepecha native-American culture of Michoacan. Veronica learned to make corundas from her mother, Juanita, the founder of Corundas Juanita; a small stand in the carnitas village square of Quiroga, Michoacan. Even after over 20 years in the business, the stand has a hand written menu that has to be redone fairly often, it practically looked brand new when I stopped by to sample these special tamales. The green leaves of the corn plant are used to wrap the tamal, not the husks. They dangle loosely from the fist-sized triangle of pure corn masa, maybe some fresh corn thrown in. Corundas can have cheese or a vegetable filling, but often are just pure masa. Each day Veronica sets up shop--her mom is retired--she brings one steam pot full of the compact packages of comfort. Veronica smiles contently, never laughing out loud, or varying her facial expression much, even when a cheapskate customer tries to talk her down from the $4MXP price per corunda, about 33 cents each. She also is gentle and congenial with Rafa, a pozole vendor that gossips all day, and gives salty looks to many of her peers at the plaza.The way she takes everything in stride, and puts up with Rafa's tacky behavior was baffling; Veronica just quietly and peacefully passes each day while working her craft. It turns out Veronica makes a pozole that's better, but sells at another location on her off days with her husband. I get the order of corundas, three corundas plus a mild tomato salsa, and Mexican cream, but I asked her to just give me one, I had my heart set on some other bites.This is just over a dollar for the works here. The key here is the masa; hand ground with a traditional metate, seasoned by manual labor. The salsa and cream are ample, yet more light and supportive to the corunda's deep corn flavor. I listened to Veronica talk about corundas--my questions were more just to hear her talk, not for information-she spoke about her family, and hinted at the long hours making corundas, but not complaining. I must have spent 45 minutes with her, although it seemed the whole day had passed.I found myself lost in her smile, coveting her natural state of being, and basking in her innocence and inner beauty. I sometimes get so drawn in to these stands; the people and their stories. There's nothing greater than the traditions handed from mother to daughter; timeless recipes from the Purepecha kitchen, with flavors that I'll never forget, and a smile that's more bewitching to me than I could ever convey. Lazaro Carenas Sur/Vaco de Quiroga Pte. mornings until she sells out, around 3PM. Go early! It's happening right now, the Artisanal LA Spring 2011 Show at Santa Monica Place!This is the premier locavore shopping event in Los Angeles, with over 60 vendors of unique products-going on today and tomorrow! What do I love about Artisanal LA? Well, living in a time where it seems everything is made overseas, Artisanal LA is creating a community of local producers of fine products that source locally. Beneath the surface of this fun, and tasty event, is an event that can make you proud to be American. No flags or slogans, just your neighbors and their talents and crafts on display to taste, wear,store,drink,drizzle and grow. Last night I attended my third preview event--as a life-long friend of Artisanal LA founder Shawna Dawson, I will always be in attendance, and on the list. This is a chance to get to know the who's who of the locavore movement, and meet the next local food stars. The vibe is always superb, with the right amount of shop,party, and family.It's a perfect shopping date for you and your girlfriends, but even us guys can have a great time, yes I said it--shopping!! Speaking of rising stars, it was back in the Fall Show of Artisanal LA that I first heard of a lovely pair of gals called Lindy and Grundy. Heard of them? The Lobsta Truck, too was debuted at the Fall Show. Who will be the next locavore hit--place your bets. Today, at 3PM, you can catch Ani Phyo, cookbook author and leader in the raw foods scene. She'll be speaking on raw foods and presenting her cookbooks: Ani's Raw Food Kitchen, Ani's Raw Food Desserts, and Ani's Raw Food Essentials. Here are some of my favorite stops. Farmscape will help you set up and maintain your own urban garden. Did I say shopping is OK for guys? Well, I scream, you scream, we all scream for hot models serving ice cream! !Go visit Amie, Sarai, and Ashley, the ice cream girls at Beachy Cream, Malibu's delicious and natural ice cream--you'll need it to cool you off. Cool wine gifts and bags from Saucy Sacks; make sure to stop by Sally's booth, it's her second time at Artisanal LA! Global Gardens has amazing olive oils and vinegars. It's so great to see them at this event, I've been a member of Global Gardens, based in Los Olivos, for several years, and discovered them on my frequent trips to the Santa Barbara Co. wine country.Uh,yes, I'm a member of an olive oil club,ok ok, I love to shop, too!! Good friend Stephane Bombet told me I had to try the desserts at Creme Caramel, and he said it with such a naughty French accent, he's French, that I had to try. This stuff is amazing, go and taste for yourself!! Cast Iron is back, bringing the flavor; this place is a favorite always at Artisanal LA, be prepared to buy, have your dollars ready, because you're going home with something from this booth. The guys at Daily Dose, opening soon, will be serving food, try the turkey meatball sandwich. And, do stop by Primi al Mercato and Norcino for an indulgent taste of Italy. I can still taste this buttery lardo, we were swiping fresh-cut pieces as the lights were going out last night--superb. Drop what you're doing and head over to Santa Monica Place, or cancel those plans tomorrow for Artisanl LA's Spring 2011 Show. Cost: $10, pre-sale. $15, door. 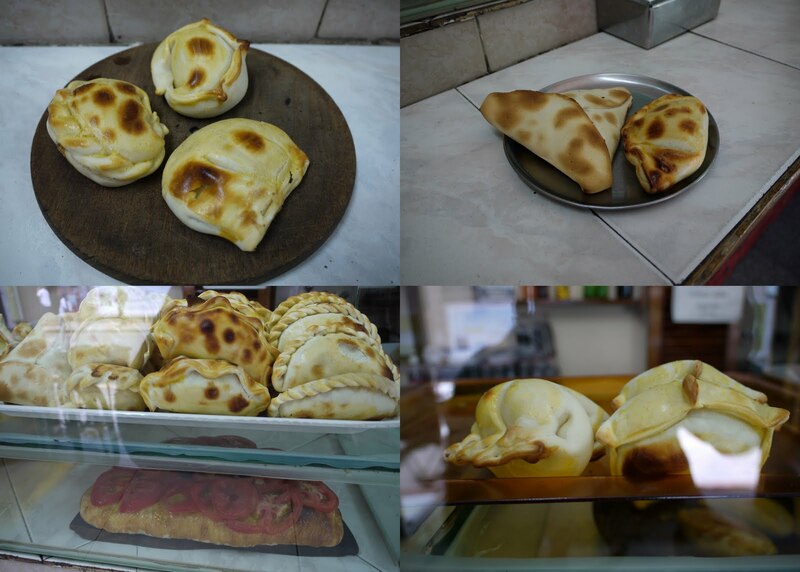 While empanadas can be had just about anywhere in Argentina, the most typical places are at pizzarias, and little pizza and empanadas specialists. While strolling around San Telmo I came across Las Leñas, named for the the traditional cooking of empanadas over a wood fire; this is exactly the kind of place I love to visit all over Latin America, a virtuosic practioner of specialty foods. Empanadas were brought to Argentina by Spanish colonists; the first documentation of empanadas was in Galicia, Spain, and in Portugal. There is a possible moorish connection to this food enjoyed all over Latin America, but Argentina has probably embraced the empanada more than any other Latin-American country . Silvia has been making empanadas, pizzas, pascualinas(savory pies), tartas(a quiche), and other baked dishes for more than 15 years at her tiny shop. She only has one chair, and it seems when I arrive for my second visit that this restaurant only caters to me. Customers come and go while I sit in MY chair, hand proping up my chin as I giddily listen to Silvia talk about food from the countryside. Her empanadas are porteña style, from Buenos Aires, known for their variety of fillings...Silvia has 12 different empanadas. The process of baking empanadas throughout the day is constant, an every few moments Silvia politely excuses herself to attend her pizza oven, where Argentina's celebrated pastries are warming. Many fillings means empanadas are folded in patterns, known as repulges, so the baker can tell them apart.Empanadas arabes(Arabic empanadas)are in the triangular shape of Middle-Eastern fatayer(pastries); roquefort empanadas resemble a white rose, perhaps it's because the scent of local roquefort that perfumes the Argentine air so beautifully. Why not start with an empanada de pollo, pronounced posho in Argentine spanish? Silvia's little bundles of joy are consistently baked to perfection; firm, white pies scorched with brown spots on the top, and slightly blackened on the bottom. The chicken filling is moist from ample onion, garlic, and spices.Each of these amazing treats will only set you back $1 to $1.25. The empanada de humita has a creamy corn filling, hearty and countrified. The jamon y queso(ham and cheese) is just as delicious as the previous empanadas I try. Rare empanadas arabes,Arabic empanadas, from the city of Córdoba come in a drier pie,Middle-Eastern style shell, with ground beef and a spicing that hints to the east, but more from the use of citrus. The local cheese doesn't get the recognition it deserves, but as one of the greatest meat traditions on the planet, you'd better believe the cheese is happening. I started ordering cheese everywhere I went on this trip, and jumped at the chance to have the empanada roquefort. The filling was oily, soft, and with those strong, cheese-locker odors so prized by the sensualist. Silvia loves Argentina, and felt bad that it is represented so negatively in the press. I assured her that in Los Angeles, most people I know are dying to be in my shoes, sitting here in her empanada shop, and taking in all the rich Porteño culture. That made her day.......and her empanadas and congeniality made mine. 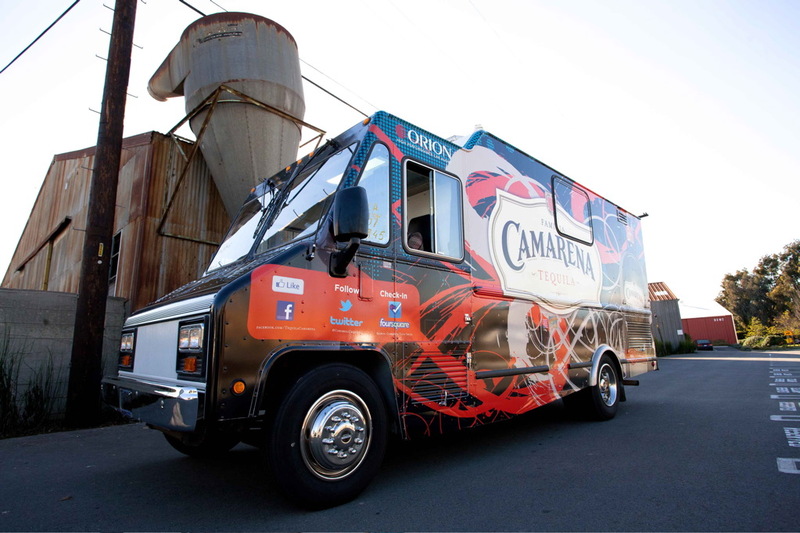 This Sunday, April 10, the Camarena Taco Truck is back with brand new wheels and a new and improved menu of tequila infused dishes. Back in September, Josie Mora of Uncouth Gourmands and I went on a ride along to deliver free tacos in Hollywood and Chinatown. Our spirited crew had a blast sipping away the hours, while feeding the hungry masses, and now this urban tequila assault vehicle is back to snack you up . Starting this Sunday(4/10) through May 7th, and in the summer at a date to be determined, keep your eye on their twitter account, and when the Camarena Truck shows up in your neighborhood, the food is on the house(truck). Free tacos!! The menu was developed by chef José Briceño of Rivera restaurant with all new items: chicken taco with red cabbage and jicama slaw, black bean tostadito with pineapple salsa and cilantro, elote flan with salsa verde and roasted corn salsa, and red and yellow pepper soup with cumin corn chips. To get a chance to preview the new menu and celebrate with the Camarena Tequila family, just RSVP here on Event Brite. Camarena tequila is 100% agave, and comes in silver and reposado; it's great in a cocktail and good enough for a sip. See you at the Launch Party this Sunday! !